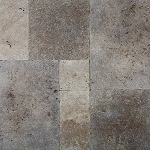 Light 1 ¼”/3.2cm Tumbled, Versailles Pattern is a group of tiles surrounding a smaller, square tile at the center, forming the Versailles pattern. The tiles have slate gray, ochre, shades of yellow gold to tan with specks and gaps left unfilled. Light 1 ¼”/3.2cm Tumbled, Versailles Pattern has a textured look that will easily disguise imperfections like dirt or cracks in your setting. It is also very easy to clean and very sturdy. 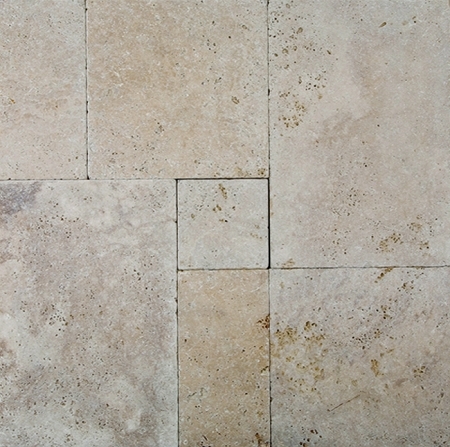 Light 1 ¼”/3.2cm Tumbled, Versailles Pattern is best used for outdoor installations due to it porous nature. It can be used as pool surroundings or garden pathways, driveways and the like.